May was a long long month, a bit boring and not that exciting, passed working from home and which reserved me a few unlucky surprises. 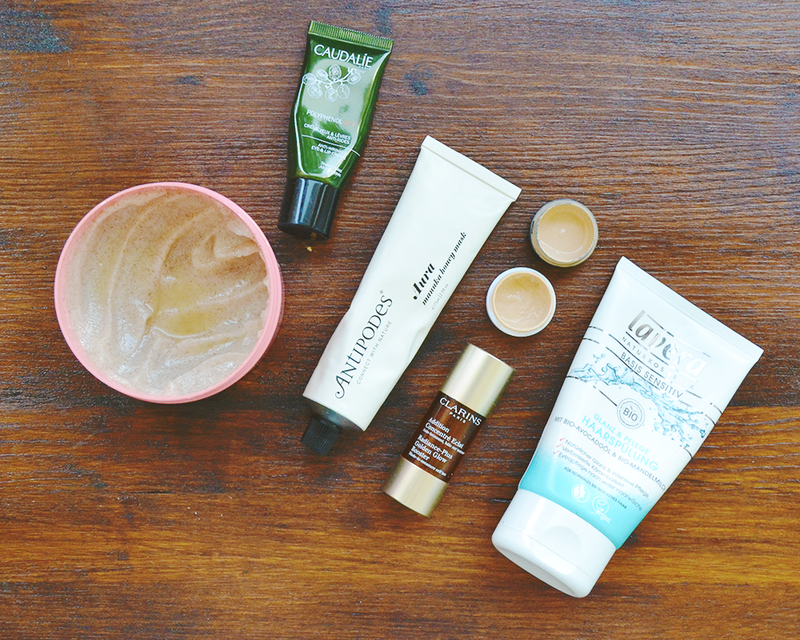 Now it’s finally over, and even if in April I decided to skip my monthly beauty favourites post, I thought I could make it come back this month as I do have some beauty products I’m loving right now to talk about this time. Makeup-wise on the rare occasions I went out this month I only wore one between the Chanel Vitalumiere Aqua (£32) and the Perfection Lumiere Velvet (£33). Both of them are only little samples which are actually lasting me a very long time and I still have a few applications left until I’ll have to make a decision between the two. Unfortunately (for my wallet) I’m in love with both of them and I really can’t decide which one I love the most. The Vitalumiere Aqua is a lighter and luminous, perfect for summertime, while the Perfection Lumiere Velvet is very matte and impalpable on the skin, such a wonderful foundation for any bad skin days. I think they both have a decent coverage and my sensitive skin doesn’t react badly to them. I’m completely sold and can’t really decide between the two! Since when I finished my beloved & Other Stories body scrub, I’m trying the Soap&Glory Flake Away Body Scrub (£8) which is not the same but still has a nice thick texture and a lovely sweet scent which makes my showers so relaxing. Probably not my all time favourite body scrub but for sure the one I’m enjoying right now and for being so inexpensive this really is a good product. Another shower favourite this month must be the Lavera Basis Sensitive Hair Conditioner (£5.95), a natural and organic hair conditioner containing honey and almond oil which aims to leave your hair shiny and easy to comb still providing added volume. I don’t think this is the best hair conditioner if you have hair that gets knotty super easly, but if your hair is standard like mine, this still makes a good job while smelling so deliciously – oh how many times I would have eaten it! It also is not like other very detangling conditioner that tend to weight your hair down, and this is the major reason why I like it, as my hair always needs a bit of added volume. 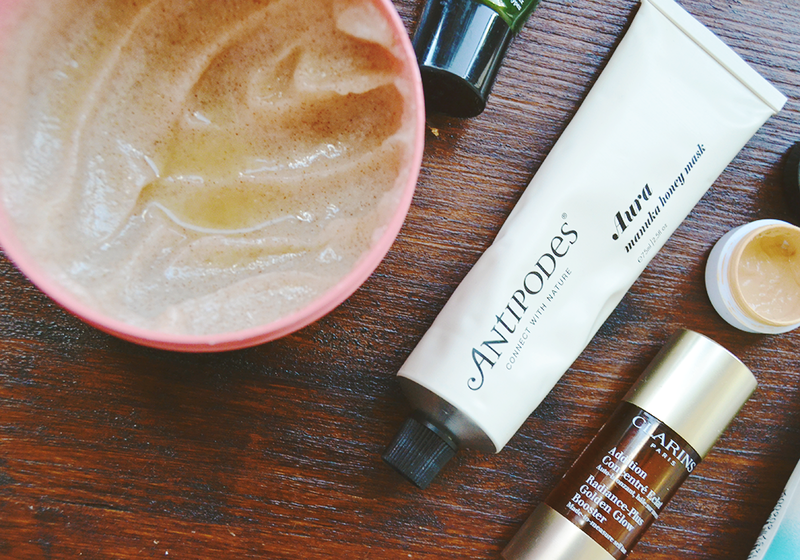 This month I’ve cultivated a deep love for the Antipodes Aura Manuka Honey Mask (£21.50): containing manuka honey, avocado, vanilla, mandarin oils, this all natural mask aims to moisturise, cleanse and be an anti-oxidant treatment all in one, but this is actually a lot more. It has the most delicious scent of all as you can imagine, which makes it so relaxing to be applied and left on for 10 to 15 minutes of peace, but it’s also very hydrating without being oily or a bit too much so that it’s great even on my combination to oily skin, and can also be used on spots and blemishes overnight to help them heal faster having anti-baterrical properties as well. Another favourite of mine will come with no surprise if you read my A Week in Skincare feature earlier this week, but it’s the Polyphenol C15 Anti-Wrinkle Eye and Lip Cream* (£26) which I only use on my under eye area but not only for its anti aging properties: as a matter of fact this is super hydrating and I have the most sensitive and dry under eye area I’ve ever seen, so this is seriously miracolous. I don’t know about its anti aging properties and if it works or not, but if you have a super dry under eye area and can’t solve with anything, try this! Last skincare favourite must be the new Clarins Radiance Plus Golden Glow Booster (£15.80), a self tanning serum to be mixed with a few pumps of your usual moisturiser which gives the most natural and gradual of the colors and not only it’s super easy to use, but also make a self tanner application without marks possible. What’s on your May beauty favourites list? I really need to try the Polyphenol15 range, it sounds just fab! Great post, love your picks!